POLITICIANS of all shades are busy drawing up their playlists of music to stir them up for the final hours of election day campaigning. Often they make the mistake of picking popular tunes with a title or lyric that matches their beliefs – such as Revolution by The Beatles or David Bowie’s Changes. So I’ve drawn up a playlist of REAL music that will definitely “pump you up”, as David Cameron might say. Or “hell, yes,” if your name is Ed. And each piece I have chosen has a political twist. First up is Glinka’s popular overture Russlan and Ludmilla – the lively opening of which was used by the Liberal Democrats in a party election broadcast during Paddy Ashdown’s leadership. Next comes the stirring slow theme from the last movement of Brahms’s first symphony. This was borrowed by Labour to fire up Neil Kinnock’s campaign in the 1980s. Sadly for him, it didn’t strike a chord with the voters. And worse, he had it playing on his in-car hi-fi when he was involved in a crash. We follow that with a double delight from two of England’s greatest composers. Benjamin Britten’s Young Person’s Guide to the orchestra, which uses a theme by Henry Purcell. Michael Howard adopted this as his election tune when he took on the might of Tony Blair, but it didn’t do the trick for him. Bit of a theme developing here, I fear. But all still good stirring music, so don’t give up. Never have politicians interfered in the genius of composers more than in Soviet Russia. It is a miracle that Shostakovich managed to produce such brilliant works while being persecuted by Stalin. The Gadfly is marvellous collection of shorter pieces written as film music and will really get you in the mood – whether you’re a hard-line Red or, like the maestro, an opponent. Perhaps the most powerful political work of all is Beethoven’s only opera, Fidelio. It is about freedom. The opera tells how Leonora, disguised as a prison guard named “Fidelio“, rescues her husband Florestan from death in a political prison. Beethoven wrote four overtures to this masterpiece. My favourite is Leonora No 3. North of the border, Scottish voters may enjoy a little bit of nationalist music before they decide…and there’s none better than the overture Land of Mountain and Flood by Hamish MacCunn. Over to Wales, I’ve opted for the land of song’s well-known composer Ivor Novello, who’s real name was David Davies! He ventured from popular music to write a lovely serious piece called…Rose of England. Finally, there was no greater socialist on the British music scene than Ralph Vaughan Williams, who showed today’s politicians of the same colour a thing or two by turning down a knighthood. Thank you for your wonderful music plain old Mr Vaughan Williams. Here’s part of his quintessentially English sixth symphony. Have a good campaign, whoever you support. Use these wonderful sounds to stir your passions but please keep politics out of our music! 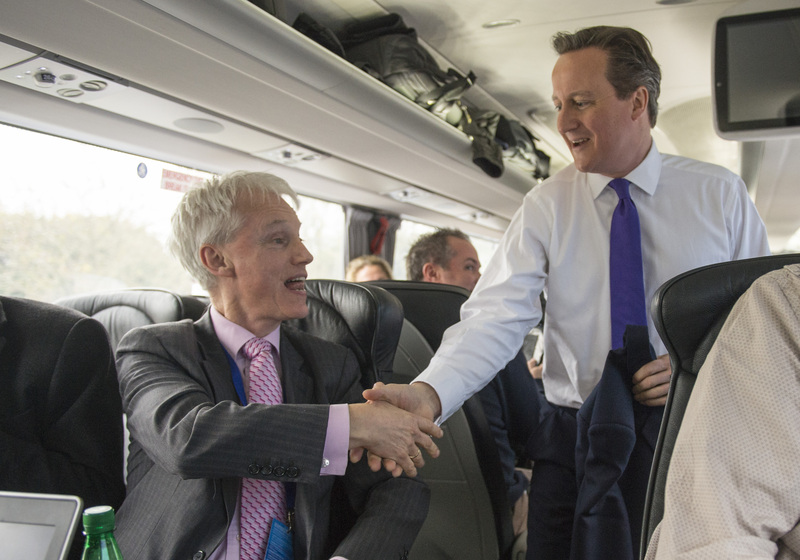 DAVID WOODING joins Chancellor GEORGE OSBORNE on the campaign trail. NICOLA Sturgeon would hit working families with a £1,063 tax bill as the price for propping up a Labour government, George Osborne warned yesterday. He claimed the SNP leader would force Ed Miliband to raid the nation’s pay packets to meet nine hidden spending pledges in her party’s manifesto. The Chancellor says the new £18.4billion “ransom note” would hurt real people – and trigger a mass exodus of job creators. Mr Osborne declared: “This is a really stark situation and we are only five days away from it. “Ed Miliband is not strong enough to win the election outright so we face a toxic combination of a weak Labour PM being held hostage by Scottish Nationalists, night after night, budget clause after budget clause. “The SNP have only two objectives – one is to get maximum resources for Scotland and the other is to make the government look shambolic to further their cause of independence. “They have already said they would borrow £148billion to meet their promises and now we’ve found nine more unfunded commitments they would write into Ed Miliband’s Budget. “We’re talking serious money here. It would add £1,063 a year to the average working family’s tax bill. In an exclusive interview, Mr Osborne also warned that businesses and investors who base themselves in Britain could flee abroad – putting thousands of Brits out of work. He said: “All this would be put at risk by Ed Miliband’s high tax, anti-business, anti-growth policies that will destroy investment, cost jobs and drive these companies away. “If we see the economic chaos of a weak Ed Miliband held hostage by the Scottish Nationalists, then jobs and investment will leave Britain. “We’re in a fight now for our country’s future now. In just a few days time, we could be plunged into political instability and economic chaos with a weak Ed Miliband, who is clearly not up to the job, propped up by the life support machine of the Scottish Nationalists. Mr Osborne added: “We’ve just done some new work on the SNP’s manifesto, which they have made very clear they will demand as their ransom note. The SNP has already said it would borrow £148billion – and no more – to meet its election promises. But the nine hidden commitments to boost welfare spending at a cost of £18.4billion would have to be paid for with tax rises. Nicola Sturgeon yesterday scoffed at Ed Miliband’s refusal to do any deals and vowed to derail his government if he didn’t jump to her tune. Mr Osborne spoke during a campaign visit to Blackpool North and Cleveleys, a key marginal seat where Tory Paul Maynard is defending a 2,150 majority. He branded Mr Miliband a “spendaholic” who would crash the economy again and “screw it up” for hard-working Brits. The Chancellor brandished a copy of the note left in the Treasury in 2010 by departing Labour minister Liam Byrne admitting there was no cash left. “We know he will end up causing everyone a lot of grief because we’ve been through it all before,” he declared. Asked what note HE would be leaving on his desk, he replied: “I’m not thinking about writing letters. I want to be back at work on Friday morning bringing jobs and prosperity to towns like this. “I don’t want to hand over what we’ve achieved over the last five years though the hard work and sacrifice of the British people and businesses to Ed Balls and Ed Miliband for them to smash it against the wall. Mr Osborne admitted her burst into laughter at Ed Miliband’s stumbling performance in the BBC election debate last week. But it wasn’t the sight of him tripping up that amused him, but the labour leader’s insistence the last Labour government didn’t overspend. The Chancellor said: “I think the entire nation laughed out loud. I thought that was a really telling moment, probably the defining moment of the campaign for me. “He looked like a rabbit in the headlights, unable to convince the audience that Labour didn’t mess up the public finances. “”The terrifying thing is not his view about history, but that he’d do it all again. “It wasn’t just that Ed Miliband physically stumbled off the stage. He metaphorically stumbled. He was unable to answer the basic question of whether we can trust him with our money. That’s the most fundamental question for a Prime Minister. During the campaign, Mr Osborne has become convinced that voters will put the economy at the forefront of their minds when they vote on Thursday. He said: “These are not abstract ideas for people who read The Sun on Sunday. It means you don’t get that job, or the job you have is lost and the mortgage bill goes up. Your income is cut, you family’s economic opportunities snatched away. “We have it within our power to have David Cameron back at work on Friday morning, the economy continuing to grow, jobs being created, free childcare and the tax-free minimum wage implemented into law. Mr Cameron hit back at his Lib Dem deputy Danny Alexander who has accused him of claiming all the credit for tax cuts and economic growth. He declared: “We did some good work together but ultimately they were my budgets and I had to make the big calls about what was in them. “The Liberal Democrats are probably desperate in this election and they are shouting and screaming to try and get noticed. “But, to be honest, people know the contest is between David Cameron and the stability of a majority Conservative government or the chaos of Miliband and the Scottish Nationalists. A vote for the Liberal Democrats is a vote for that chaos. HE was famously booed at the London’s 2012 Games. 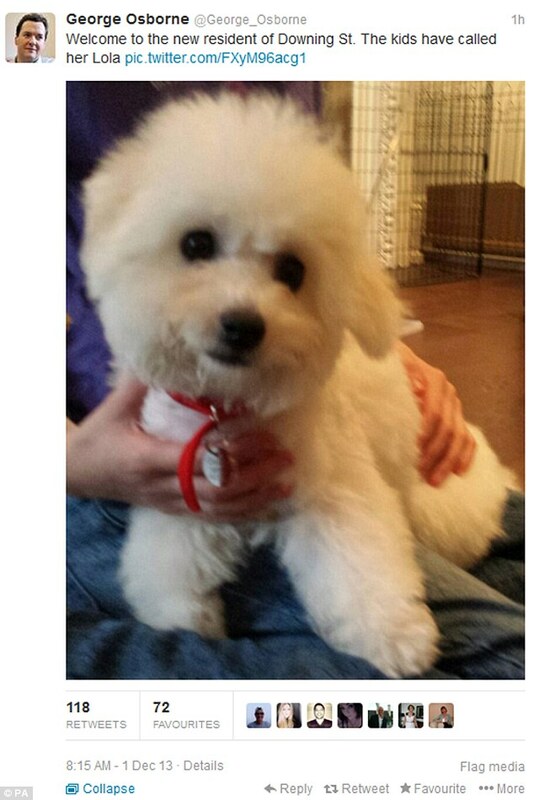 But there’s one fan who’s always pleased to see George Osborne – his new pet pooch Lola. The cute and fluffy Bison Frise always gives the Chancellor a warm welcome when he arrives at 11 Downing Street, where she has been top dog since December. Mr Osborne said: “She’s great and is always pleased to see me, which doesn’t always happen to a politican. “There’s an unquestioning love there which is reciprocated. I didn’t grow up with a dog. We had cats. So it was quite a big step for us but it’s been brilliant. Lola has even brought new meaning to his job of clearing up the mess “Labour left behind”. Dad-of-two Mr Osborne admits that when it comes to running the household economy, his author wife Frances has an equal say. To relax they watch boxed sets and recently he’s spent his spare hour off glued to TV hit Poldark and admits to having a soft spot for heroine Demelza. The Chancellor admits 11 Downing Street is an “odd place to grow up” for their kids Luke, 13, and Liberty, 11. Luke is into vinyl records and uses “every spare penny” to buy old LPs from the 70s and 80s from groups such as Duran Duran. Liberty loves cooking and has been watching the Masterchef finals and the Great British Bake Off. “I used to do a slow-cook leg of lamb with macaroni. You put the lamb in the oven with some tomatoes and onioins for about four or five hours and they you add the macoroni for the last 20 minutes. It’s really good. Which kitchen does he prefer to cook in? “I just have the one,” he said. 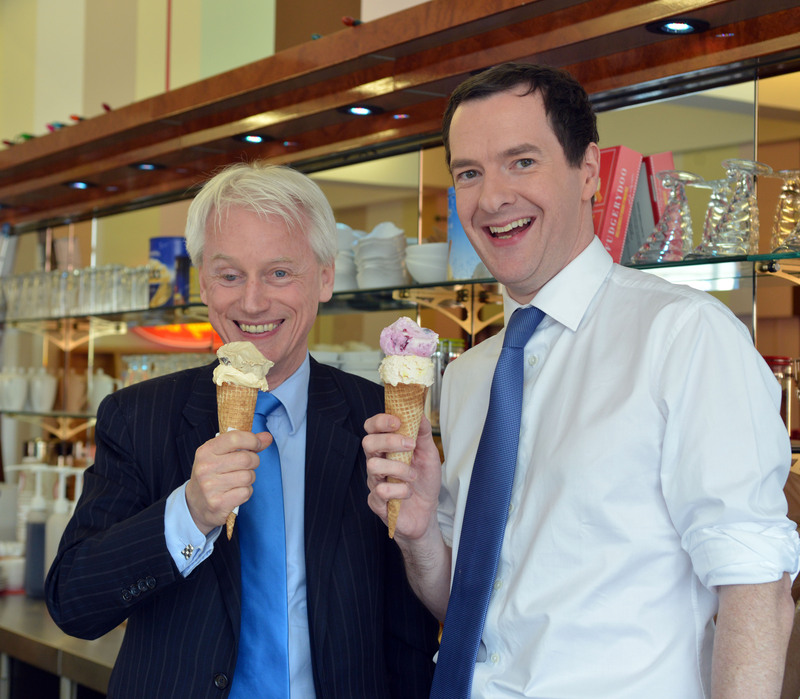 CHILLED George Osborne served ice cream at a seaside shop and admitted: “I’m a bit of a vanilla man”. He was invited to a few scoops from an array of flavours at the New Yorker sundae parlour in Cleveleys, Lancs, but plumped for the plain and traditional. But being a vanilla-lover is not as boring as it sounds. An ice cream personality test website describes them as colourful, impulsive risk-takers who set high goals and have high expectations of themselves. 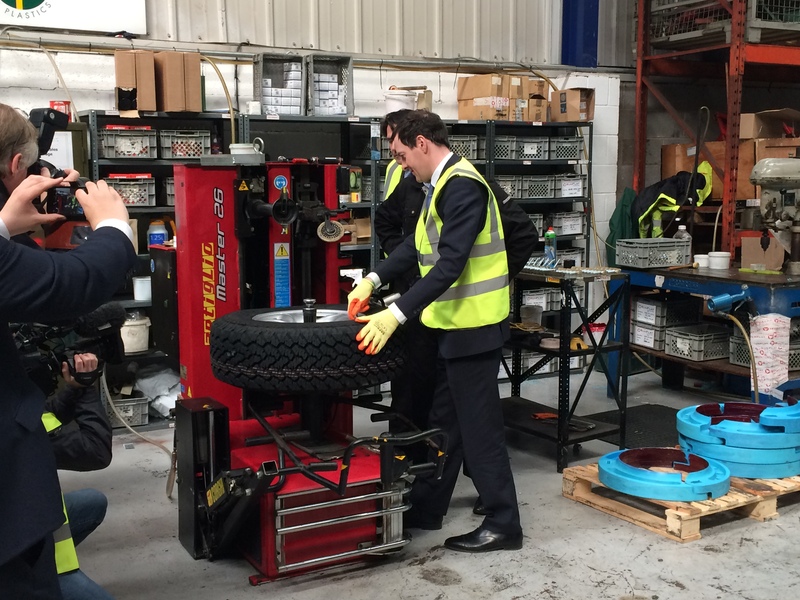 GEORGE Osborne has made so many factory visits he’s now got his own high-vis jacket and hard hat. He’s had to wear flourscent safety gear at least 40 times during the election campaign after stepping out of his Treasury “bunker”. He admits he dug himself in during a “difficult period” but added: “Then, I realised you can’t behave like that when you’re democratically and accountable politician and you’re taking decisions that affect people’s lives. “You have got to go out there explain yourself. I found that if you’re stuck in the Treasury, you don’t hear anything new and you don’t engage with people. “So I got myself out and about and I’ve really enjoyed it. A lot of things we’ve done, a lot of initiatives we’ve pursued like the concept of the Northern Powerhouse, came from these conversations and not thinking all the answers like within the square mile of Whitehall. The hi-vis Chancellor has also posed for a string of selfies – including one with Chelsea boss Jose Mourinho. Blues fan Mr Osborne for once the person doing the asking when they met for the first time at an event for football-loving MPs. He’d like to be at Stamford Bridge tomorrow where Chelsea hope to secure their fifth league title. But he says: “I don’t know whether people would ask what I’m doing but on the other hand we haven’t won the league for five years – and last time we were in the middle of an election, too. ED Miliband was branded a back-stabber yesterday by Boris Johnson who vowed never to knife his own MP brother. The London Mayor launched a blistering attack on the Labour leader over the ruthless way he snatched his party’s crown from his big bruv David’s head. Tory Boris said he and his rising star brother Jo will stick to a Mafiastyle code of “never, ever” turning on each other. In an exclusive interview, BoJo was scathing over Red Ed’s brutal knifing of his own brother in the 2010 Labour leadership battle. He said: “He clearly stabbed his own brother in the back. There’s all this pseudo indignation of the Left whenever anyone utters those words. “But it’s a well-known political metaphor we have been using all our professional lives. “Nobody is suggesting David Miliband presented himself at A&E with a knife between his ribs. But however you look at it, I don’t think he was too chuffed about what happened. Orpington MP Jo Johnson, 43, head of the 10 Downing Street policy unit, is tipped as a future Tory leader, like his better-known older brother. But Boris, 50, insists there is an unwritten family rule which forbids them fighting over the top job. Then he quoted Michael Corleone’s words to his own brother in The Godfather. 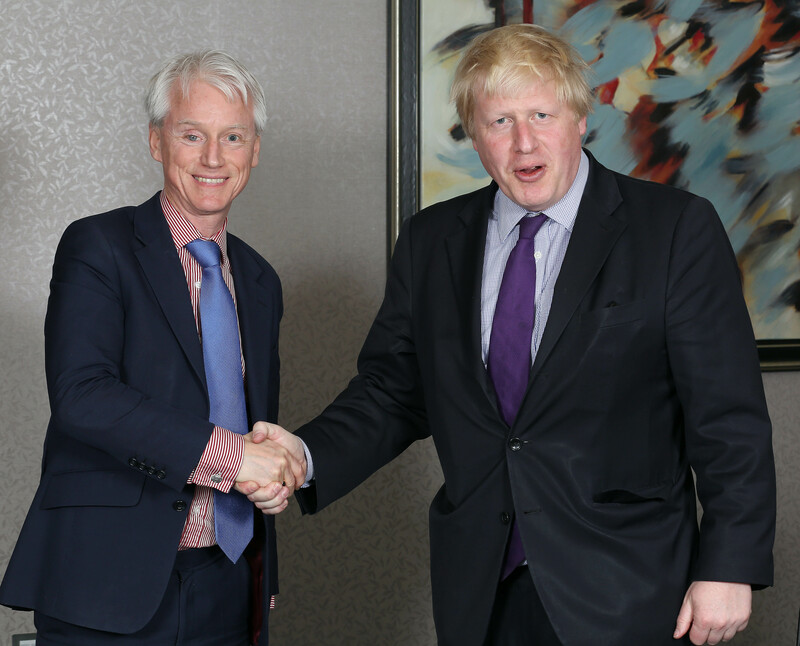 Bojo dismissed Mr Miliband’s “useless” record in government and claimed the Labour chief would be a “lapdog” of the Scottish National Party if he ever became PM. He added: “I don’t think he has the slightest interest in or understanding of the wealth-creating side of our economy. “You need a strong and healthy public sector with great healthcare, schools and infrastructure but you also need the wealth-creating sector to be vibrantand dynamic and competitive. Boris warned Mr Miliband would have to plead “on bended knee” before the SNP to get things done. He said: “He would be the lapdog of Nicola Sturgeon and Alex Salmond and they would be diverting big sums of investment away from the South East, away from London, away from England. Boris recalled how Red Ed missed a chance to create thousands of jobs when in Gordon Brown’s Cabinet. He said: “I had some dealings with him when he was luxuriating in the post of Secretary of State for Energy and Climate Change, and we had a great plan to save money and create thousands of jobs. “This is when the crisis had just hit, thousands of businesses were going to the wall and 190,000 people lost their jobs in a few months. went to Miliband and said, we’ve got a great plan. You can retrofit your home so you can put in lagging and it will create jobs, save money and cut CO2and you finance it out of the future savings on energy bills. “He wasn’t interested. He didn’t understand it. He didn’t care and I came out of that meeting thinking we’re going to have to do this on our own or with somebody else. David Cameron sees Boris, who is standing in Uxbridge and South Ruislip, as his “secret weapon” in the closest run election in decades. As ew quipped afterwards: “Ed-o, you’re my brother and I love you, but don’t ever take sides with anyone against the family again”. The mayor thinks there is nothing wrong with private firms being used efficiently in hospitals. THE Tories will soon have more black and ethnic minority MPs than Labour, he claims. “Yes, we are still overwhelmingly white and middle class but we are changing fast. He blames the last Labour Government for creating an immigration crisis. BORIS may be posh but has only one kitchen and is happy to make that clear. His also owns a single TV set and a battered old car to use when not on his bicycle. He spoke out on the Ed Miliband kitchens row. Boris said: “I don’t give a monkeys about how he eats bacon sarnies. I don’t even care how many kitchens he has. THE London Mayor loves being a dad and jokes his main role is to embarrass his kids. He often sang the Jimmy Cliff hit “I can see clearly now” at the top of his voice while taking his youngsters to school. 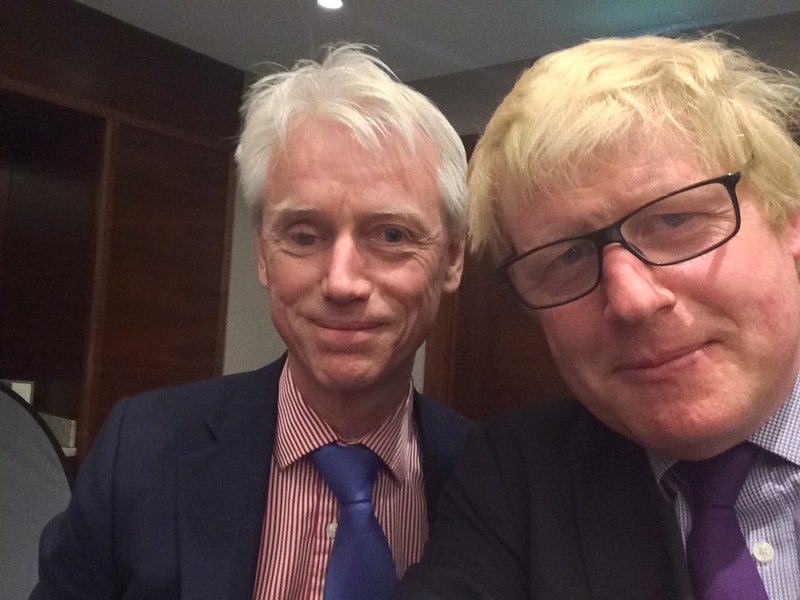 The Old Etonian dad-of-four fondly remembers his days at Primrose Hill state primary school in North London – one also attended by another political figure. He grins: “Don’t forget, I was educated at the same school, I’m proud to say, as the party leader…Ed Miliband. “It is a great school and I absolutely loved it. You should ask Ed Miliband whether he can remember Mr Nyman and Miss Climbie. I be he can. Mr Nyman was the music teacher. He said: “I think, inevitably, they find me extremely embarrassing but that’s the case with all fathers at some stage or another. The dad of four fondly recalls his days at Primrose Hill state primary in North London. He grins: “I was educated at the same school, I’m proud to say, as Ed Miliband. 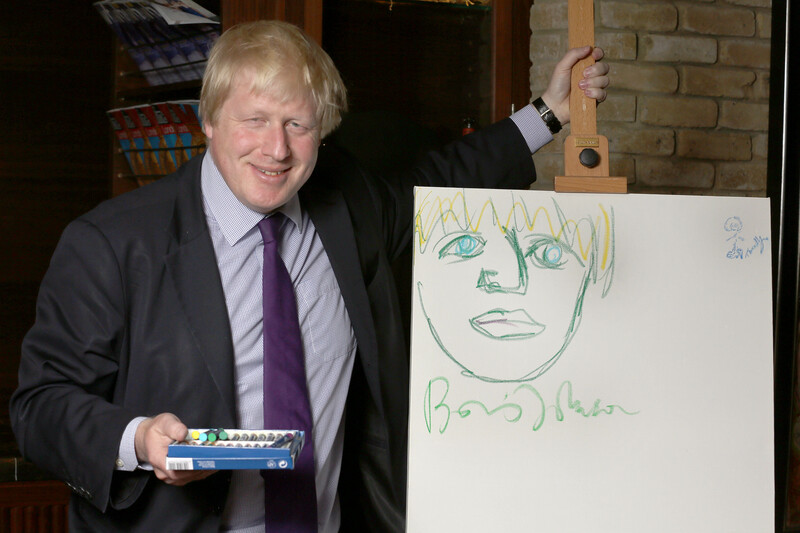 BORIS loves ITV’s portrayal of him in the new satirical show Newzoids. DAVID Cameron has been taking the rough and tumble of the election campaign in his stride because his biggest critics are at home. The PM reveals his three kids are always poking fun at him over everything from his casual dress sense to his taste in music and films. In a frank interview with The Sun on Sunday, Mr Cameron gives a rare glimpse of life in 10 Downing Street with the children he calls “the light of my life”. CLASHED with wife Samantha over whether their kids should be allowed to have tattoos. BLOCKED eldest daughter Nancy’s demands to have her ears pierced. STAVES off hunger during the gruelling campaign with bags of popcorn and peanuts. TAKES tips from former PM Sir John Major, who won the 1992 election against the odds. The PM gently spelled out how May 7 could turn the family’s world upside down in a heart-toheart with Nancy, 11, Elwen, seven, and four-year-old Florence. He said: “I sat them down a few weeks ago and told them what would be happening and the possible outcomes. “They like Number 10 and would miss it, and Larry the Downing Street cat who’s become almost like part of the family. But he added: “They still take the mickey out of me daily, which they enjoy. To them I’m just a normal dad, who they think is a bit square and sometimes embarrassing. It’s very sobering to come home to after a day in the office. Mr Cameron says he is teaching his adored son to play tennis and cricket, in which he’s a good bat. He admits Nancy, who starts secondary school in September, is already starting to act like a teenager, and wants her ears pierced. And tattoos? Sam has a leaping dolphin on her right ankle and would be “fine” if her kids have body art, but her husband says they’d have to clear it with him. He said: “I’m not a big fan. I love Samantha’s tattoo, it’s very small, very discreet. But I’d be a square dad and tell the children to think very carefully about it.” Nancy, he says, is also developing a wicked sense of humour and has made up her own jokes about Ed Miliband’s two kitchens. The PM opened his heart on the Conservative battle bus on which, in between speeches, he ploughs through his ministerial red box and takes phone calls. He revealed he’s in touch with former PM Mr Major who bounced back to win the 1992 election after being written off by pollsters. Mr Cameron admits to having a sneaky chuckle when he read The Sun on Sunday’s scoop about Ed Miliband leaving his notes behind — calling himself the “happy warrior” — after the TV debates. Mr Cameron insists the hard, 17-day slog ahead is all about the hopes and dreams of the nation. He says: “It’s frustrating people keep saying they don’t hear any vision from us. But there’s no bigger vision than saying to people, let’s build a country where, if you work hard, there’s a job for you, there’s an apprenticeship, a university place, a home that we can build that you can buy and own. “There’s a family you can raise who can have a good place, there’s a good school for your child and there’s a retirement you can enjoy. DAVID Cameron reveals son Elwen laughs at his love of old westerns starring legends like John Wayne, left. He says his kids also laugh at his music tastes, which include Radiohead, The Smiths and Pink Floyd, who wrote Dark Side of the Moon, right. THE PM admits his blood boils when fat cat “experts” attack his bid to widen home ownership. He blasted Lib Dems who have blocked his right-to-buy scheme and added: “We’re mad to have council houses worth a million pounds. He said: “These so-called experts who are criticising us are all people who have bought houses themselves, often very nice houses, on large salaries. Johnson, below, is a vital part of the election team — and is on the phone to the PM daily. Aston Villa fan Mr Cameron, who hopes to find time to watch at least part of their FA Cup semi-final against Liverpool today, likened BoJo to their top striker. DEFENCE spending is locked in for ten years, with £160billion of aircraft carriers, frigates, subs and jets and other kit “guaranteed”. He said Britain would spend two per cent of national wealth on defence this year and next, despite his refusal to set the figure in stone. He said: “We can’t make that pledge until the autumn when we look at spending on all departments.